In January 2018, Domino’s began trialing the addition of vegan cheese in Australian stores after a Facebook poll determined there was demand for the ingredient. After running out of supplies within a week of launching the trial, Domino’s CEO Australia and New Zealand, Nick Knight, says Domino’s has brought vegan cheese back for good. “We knew the response was going to be big after the demand we saw for the product on social media but we had no idea it was going to be this big,” Knight said. Domino’s customers can choose from three entirely vegan pizzas or alter existing orders so that they are vegan. All Domino’s pizza bases and sauces are vegan making it easier for customers to change a pizza so that it is vegan. 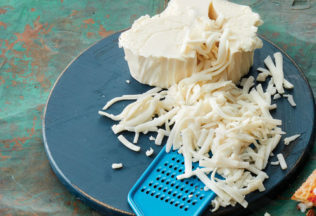 “For an additional $2.95, people can simply swap out our usual mozzarella for the vegan-friendly alternative,” Knight said.